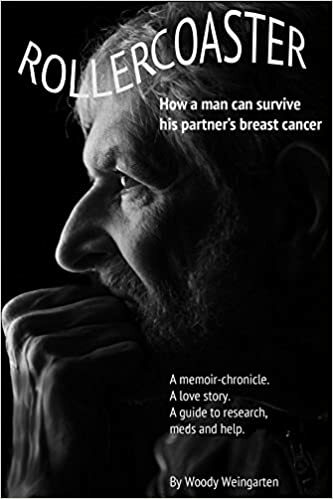 Continuing with our author-interviews-author series, BAIPA board member John Byrne Barry interviews author Woody Weingarten, who wrote Rollercoaster: How a man can survive his partner’s breast cancer, after his wife recovered from breast cancer. Q: Tell me about your book. Rollercoaster grew out of my own experiences 24 years ago when my wife had breast cancer. She went through surgery, radiation, chemo, and today’s she’s thriving. As a result of my experiences as a caregiver, I thought I could help people who had breast cancer, and their caregivers. Not just cancer. People facing any life-threatening situation. The book stemmed from my journals during that time. I’ve been a writer and editor since I was 20 years old, mainly for daily newspapers back east. Though I did a lot of research on the medical side, I’m not a doctor, and my focus is the emotional aspects — how the ups and downs affect the caretaker. In today’s world, almost everybody will play that role at some time. Q: So from what you just said and the book title, Rollercoaster, it sounds like one of your themes is the ups and downs. The downs are obvious. What are the ups? In most cases, a couple ends up closer together because of what they’re going through. Together. There are obviously great variants between individuals and how they react. But because of the life-threatening aspect of cancer or other diseases, people bond more than they ever have before. Some families will grow closer as well. Friends can sometimes come out of the woodwork and become closer. The opposite is also true, that there will be people who will disappear because they don’t know how to handle it. The idea is not to linger on the negative. To focus on the positive. But don’t say you’re going to be OK because you don’t know that. Q: What has resonated the most in your experience and research? The main takeaway is that you only have today. Live every day as if it’s your last day. We have done that now for 24 years. My wife is fine, by the way. She’s in a breast cancer support group. I run a men’s group, Marin Man to Man, that meets every week. I’ve been running it every week for 24 years. It’s a drop-in group. People come in, they leave. We currently have 11 guys who come regularly. The book uses my experience as a springboard to the broader topic. Whether it’s a lumpectomy, mastectomy, or something else, the psychological and emotional aspects are pretty much the same. I’ve also listened to stories of other men for 24 years. The reason men join my group is that they’re willing to be vulnerable and open. Those kinds of men are going to be more supportive. You can’t be macho when facing your partner’s cancer. You can’t fix it. Q: I imagine that there are people who are not good caregivers. How do they manage? The first tip, close your mouth and listen to what your partner says. What she wants. Then try to follow through. Don’t guess or project your own thing on her. Most men don’t want to listen. They just want to act. You have to show up emotionally. The idea of being a person who is not running the show, but is subordinate. This can be difficult for men. Every man goes through a learning curve. It evolved because of the men’s group. I joined one because I needed support. My wife was going through treatment and couldn’t be my caregiver. The group listened and supported me. I thought there was a need for a book like this. Shortly after I joined the group, I became the leader of it. Q: Tell me about the publishing and marketing part. I tried to get the book published through a standard publisher. They told me it wouldn’t sell enough copies. Then I looked into self-publishing. That met my needs better. I got the book into many bookstores. But they would bury it in the health section. Most of my sales have been at talks at bookstores or through Amazon. But I’m not very good at promotion. When I ran my own newspaper in Florida, selling ads, that wasn’t my thing. I’m a writer and editor. I’m writing a second book, called Sizzle! About keeping the spark or renewing the spark in your relationship. The focus is on what I call MysteryDates. My wife and I have been doing them for 30 years. It can be as simple as going to dinner, but the idea is that one of us plans it and the other doesn’t know what it’s going to be until it happens. I’ve got 30 chapters. How you can do dates that are adventuresome? Sports-related?Restaurants? We’ve done trips too, Vegas and Hearst Castle. The subtitle is How MysteryDates can keep your relationship spontaneous, spicy and sunny. I finished the first draft. Now I’m rewriting and editing. Aiming to publish at the beginning of 2018. Q: What do you do when you’re not writing books? My wife and I spend a lot of time with our granddaughter — every other weekend. Recently, we took her to visit Guide Dogs for the Blind. I also write entertainment reviews for the MarinScope papers — theater, ballet, symphony, and so on. Last year, I did 90 pieces for MarinScope papers. My wife contends that there is a magnet that is implanted in my rear end that attaches to the seat in front of my computer. I have tunnel vision. Comes from working for newspapers most of my life. I can work in the din and bustle of a newsroom. I worked in Philadelphia one day when a guy roller skated through the newsroom. I kept working. I love Woody’s reviews in the Marinscope papers. He makes them sound so entertaining that I want to go buy tickets – but…they’re often published after the show’s run has ended; or it was a one-night sensation. I wish the venues would give him a sneak preview so he could rave about them in advance. Great interview, guys. I really appreciate the “feminizing” you went through, Woody. Many baby boomers need to go through this as we age and face health issues. Can’t say enough for support groups.